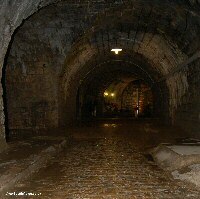 This is one of the main and also most interesting sites in the Verdun battlefield. 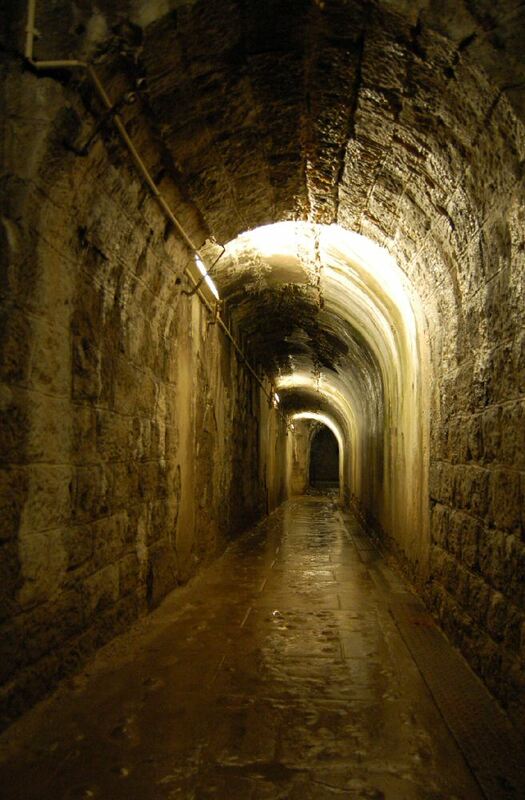 Fort Douaumont was one of a series of forts near Verdun, constructed after the Franco-Prussian War in order to ensure the area could be defended against any future attack. 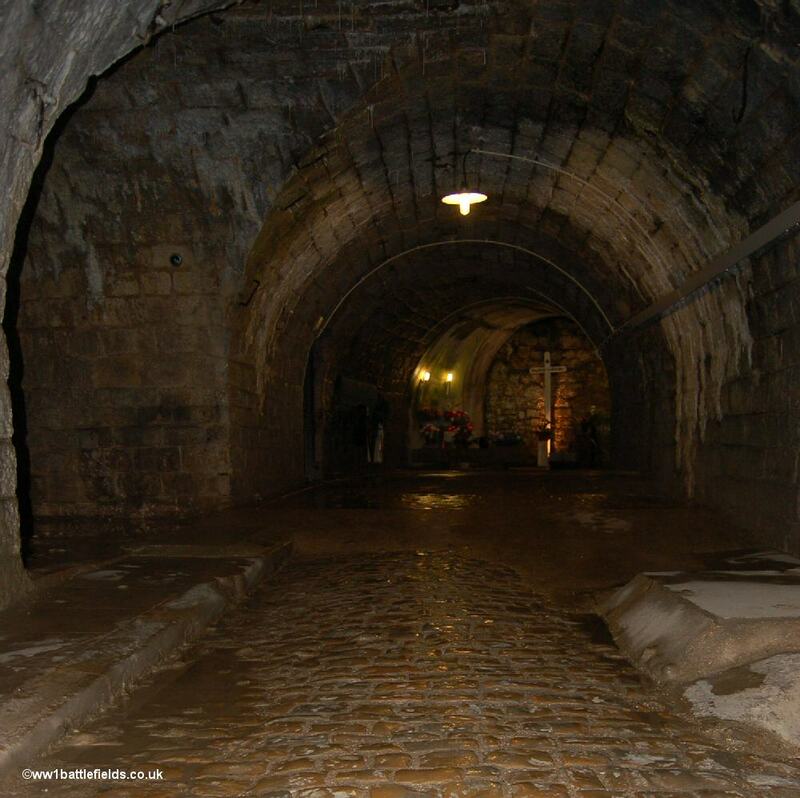 It was constructed mainly between 1885 and 1891, with the concreting taking place in 1888. Work did not finish however until 1913. The fort stands on a site over 1,200 feet high, and as can be appreciated when walking on the top, it has commanding views over it's surroundings. The barracks were built to accomodate a garrison of 635 soldiers, and as well as dormitories contained water tank and kitchens plus a bakery. In 1914 the garrison was smaller in size than the maximum; only a single infantry company plus artillery and engineers, just under 500 men in total. 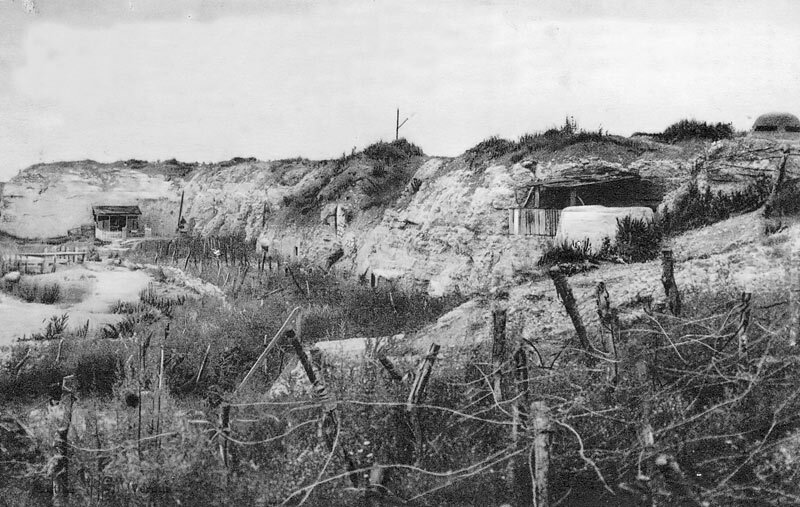 However, after similar Belgian forts failed to hold up the German advance into Belgium, views on the usefulness of such fortresses changed, and the garrison was much reduced. 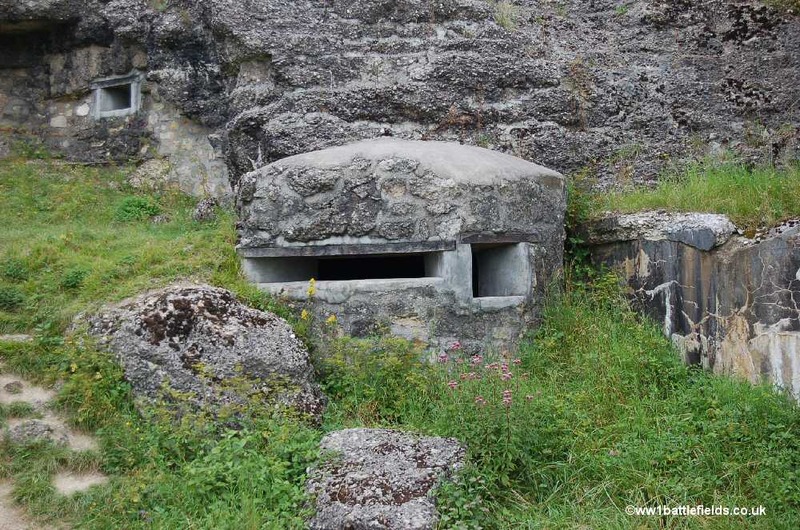 When the German offensive near Verdun began in early 1916, the fort had been disarmed of nearly all it's large guns and only a tiny garrison of 57 French soldiers was present. 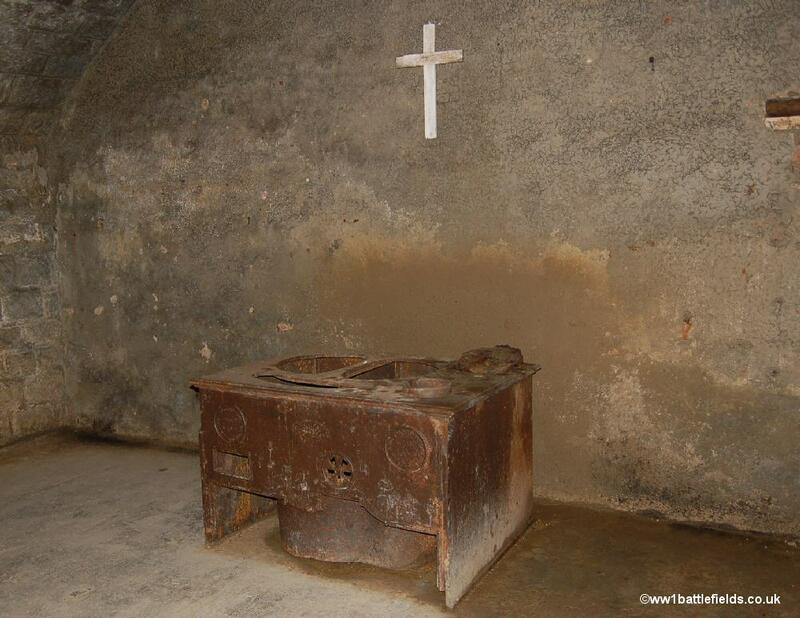 The Germans therefore captured Fort Douaumont on the 25th of February 1916 with relative ease. There is a large parking area near to the Fort, and on the front of the fort are various plaques with inscriptions; one commemorating the actions of the 24th of October 1916, when French Colonial units including soldiers from Morocco, Senegal and Somalia recaptured the Fort from the Germans. Another remembers the 679 German soldiers who died in the fort when there was a massive explosion of stored munitions early in the morning of the 8th of May 1916. 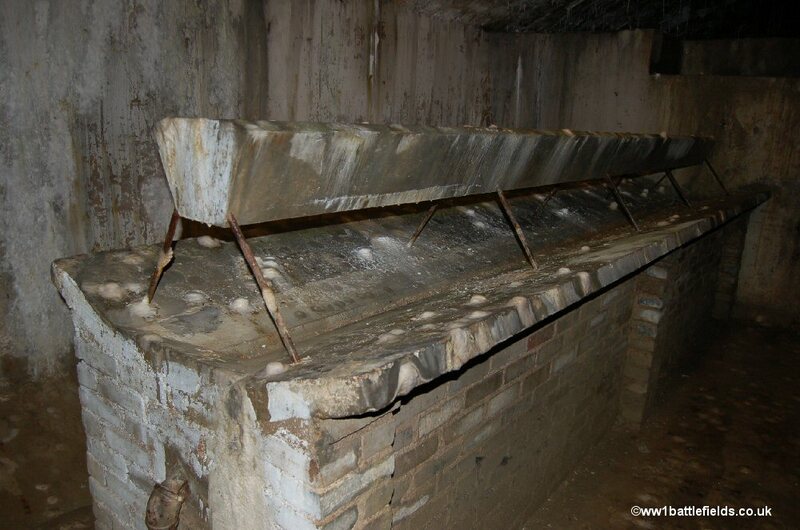 The site where their remains lie can be visited when touring the interior of the Fort (see below). One enters the fort through a small area where there are a number of items for sale. There is a small charge for entry, and a handout is provided explaining the fort, available in a number of languages. The interior of the fort is damp and chilly - stalactites can be seen on many of the rooves, and when the corridors are empty, sounds echo eerily along them. It can be un-nerving: I stepped on a metal plate which clanked and the sharp sound which then reverberated made me jump. Bats swoop occasionally near the ceilings. After entering the first corridor there is an information board. 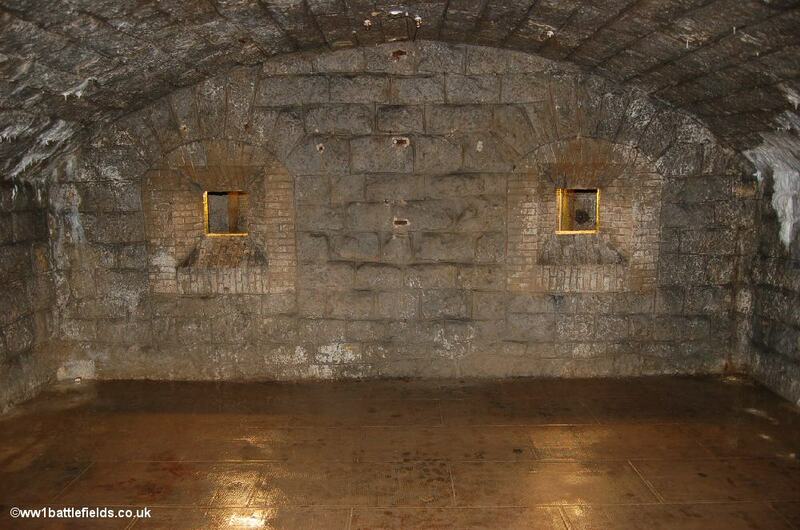 There are several kilometres of tunnels inside the Fort in total, with only a small proportion open to the public. 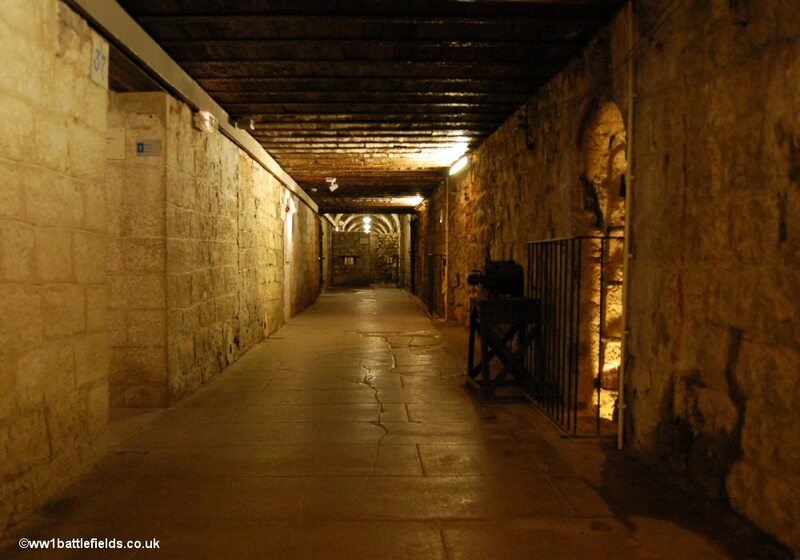 The ceiling of the fort is six metres thick, and it is estimated that in 1916 the fort was struck by between 800 and 1400 German shells each day. 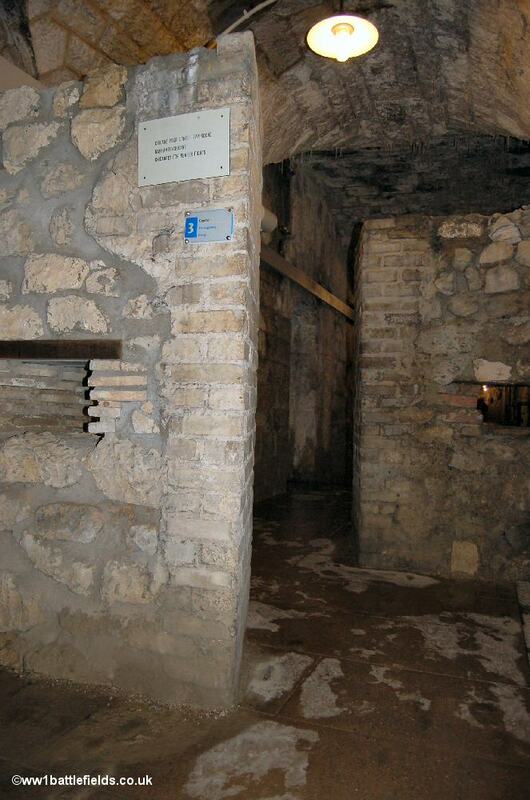 This main ground floor corridor was named by the French the Galerie Mangin, after their commander in charge of the operation which recaptured the Fort on the 24th of October 1916. To follow the tour suggested on the handout, follow this first corridor to the left. The first room on the left holds a number of relics recovered from the site. 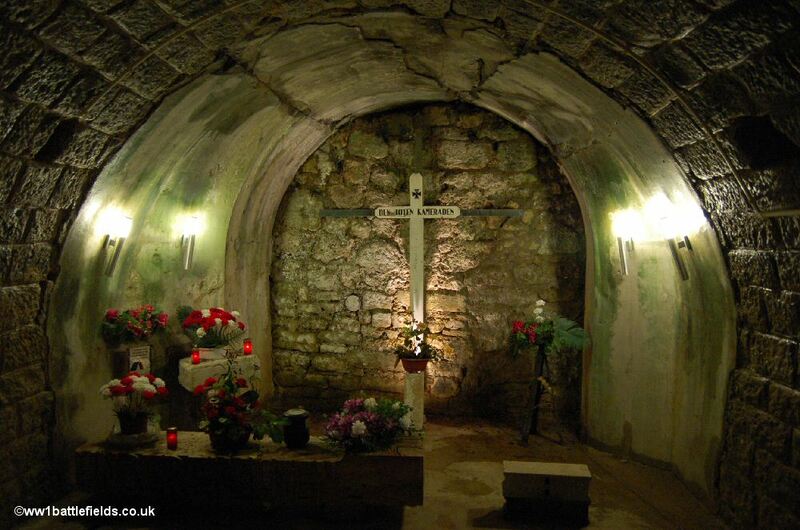 The room was used as a chapel by the French after they retook the fort in October 1916. As you walk along the corridor, a number of features of interest can be seen. 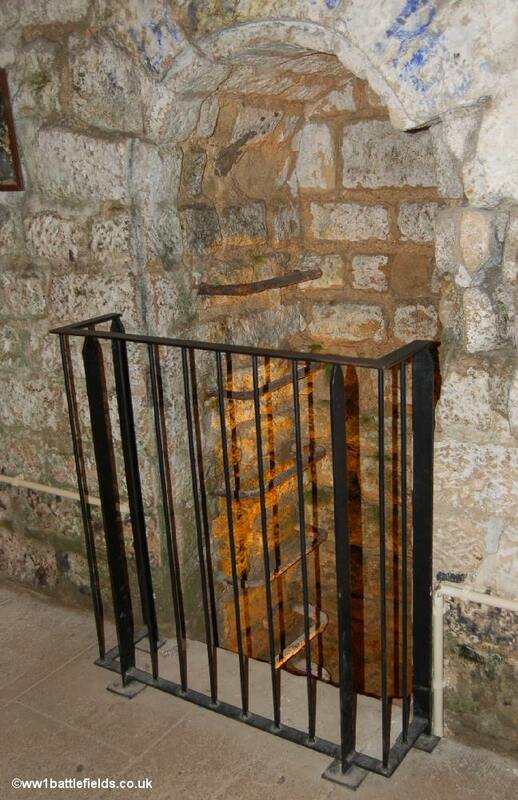 Firstly, there are small niches in the wall to the right (now with guard rails) where metal rungs lead down to the level below; these were how the garrison gained rapid access to floors above or below. Then, there are wires which run along the top of the wall near the ceiling, which presumably carried electricity or possibly were some sort of alarm system. They may have been to do with a telephone system; during their occcupation, the Germans sited a telephone exchange in a room near here. A room off to the left a little further on (Barrack room 33) is where 30 German soldiers were killed when a French 40 cm shell exploded here on the 23rd of October 1916. 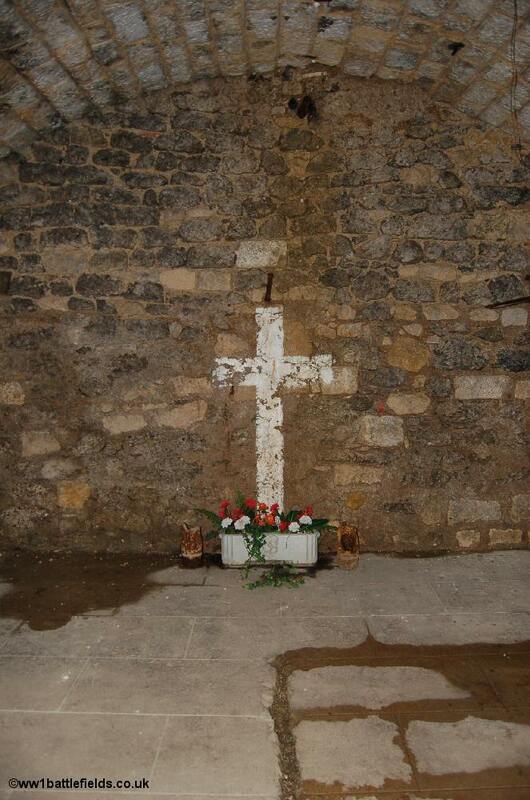 A cross is crudely painted on the stone wall, and there are flowers at the base, along with a more grim reminder - fragments of shells. About half-way along the main corridor on this level, there is a position where walls have been built half way across the corridor complete with loopholes, to aid the defenders position should the fort be penetrated. 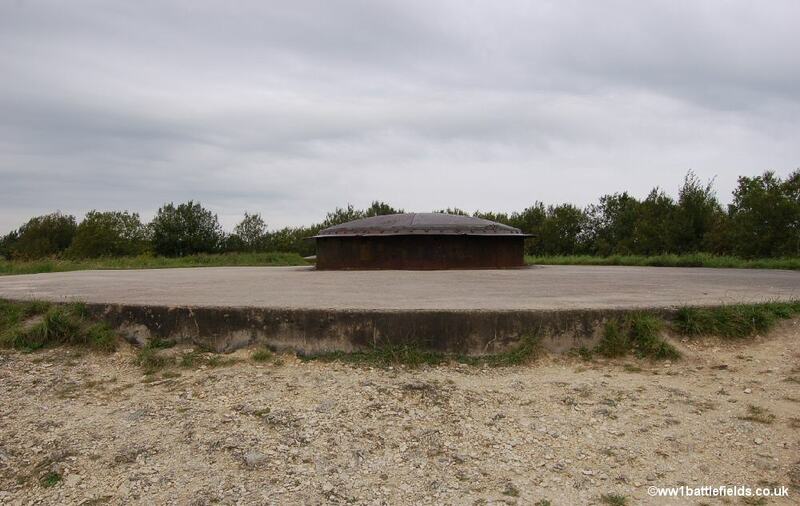 One would imagine that this position could be defended for some time against an attack, but it was only built after the French had retaken the Fort in October 1916. 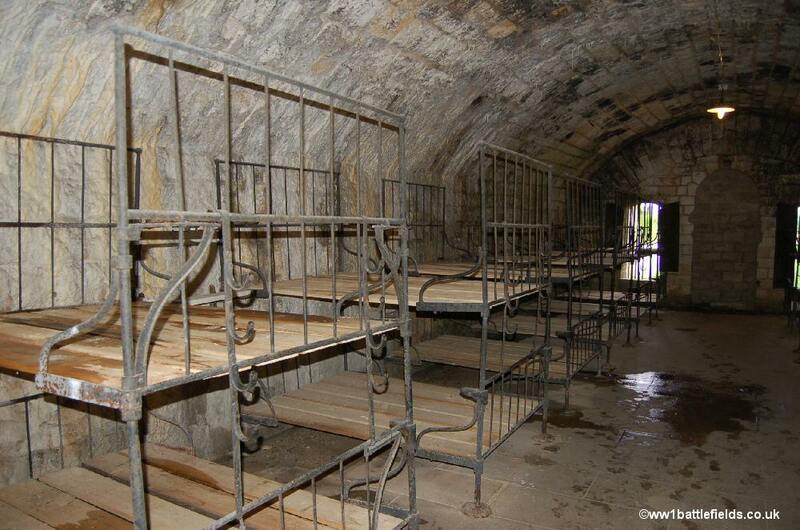 A little further along is one of several dormitories, which has been re-equipped with iron and wooden bunk beds. Just walking into the room you can imagine that sleep must have been difficult, as every sound, both here and elsewhere in the Fort, echoes and reverberates around. Sleep may also have been difficult due to over-crowding: at some points there were as many as 3,000 soldiers garrisoned here, some four times the number it was designed to hold. 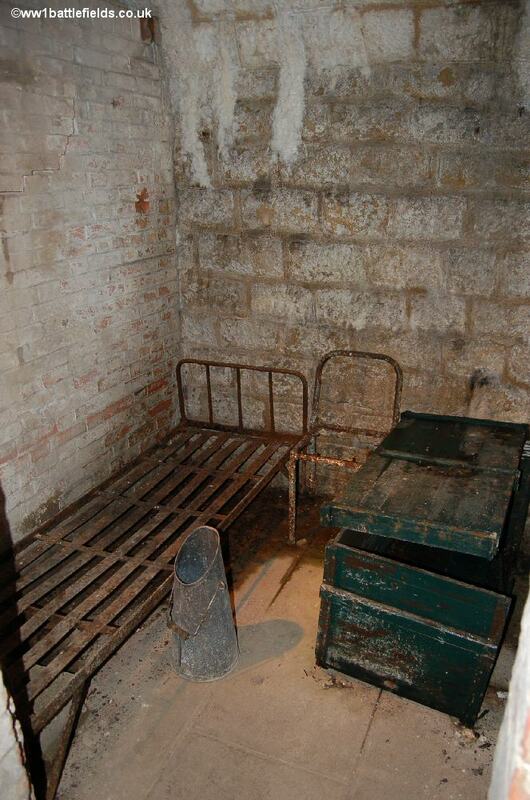 There are also Officers Quarters, where a single bedstead and the iron frame of a chair show that at least the officers had a certain amount of privacy, although conditions must still have been very hard. Also on this level are kitchens, and at the end is the 'German Cemetery', where the soldiers referred to on the plaque on the exterior of the fort were buried behind a wall. A cobbled section of corridor leads to this room - this may have been part of the western wagon road which passed through the fort. In total, somwhere between 800 and 900 Germans were killed in the expolsion which occurred at 6 a.m. on May the 8th, 1916. 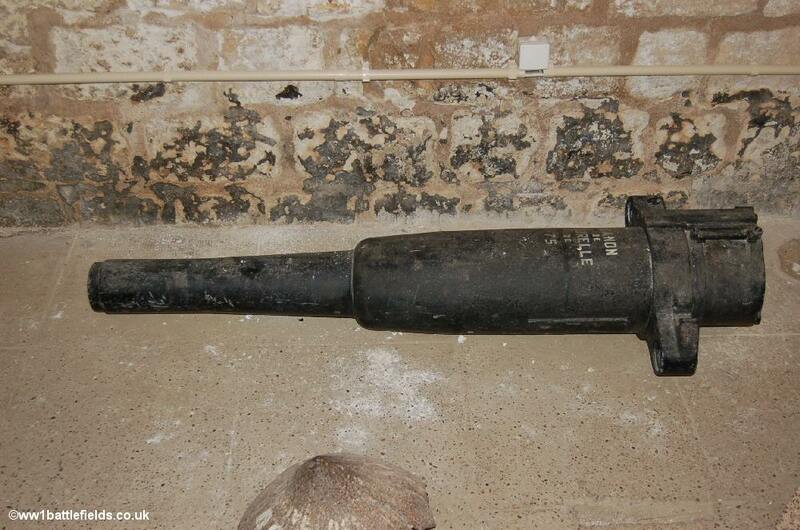 It happened when a store of grenades exploded, and nearby flamethrowers also then ignited. The appalling scenes can only be imagined. Some of those who died were buried outside the Fort, but there were so many bodies that many were walled up in two casemates here in the Fort itself. Six hundred and seventy nine lie behind the wall here marked with a cross remembering "the Dead Comrades". There is also a metal plaque on the wall to the left commemoratring those who died here. Next to this, a staircase leads down to the lower floor, where one of the first rooms is the latrines - essential facilitties for a large garrison of men. However, the handout reveals that the difficulties of bringing water into the fort reduced the usefulness of these facilities. It also explains that the fort did not have any lavatories in 1916, and that the stench in the fort was so bad that soldiers were constantly affected by nausea. 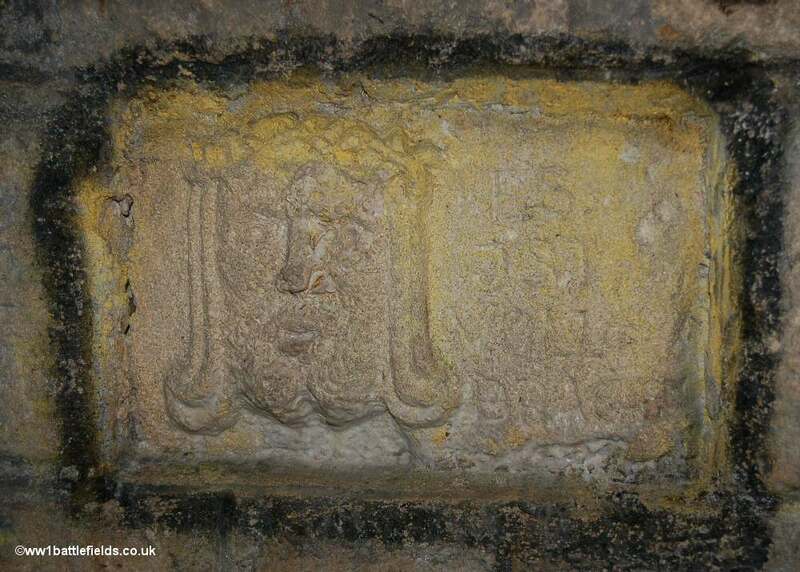 On this level the iron rungs which lead to the level above can be seen leading upwards. 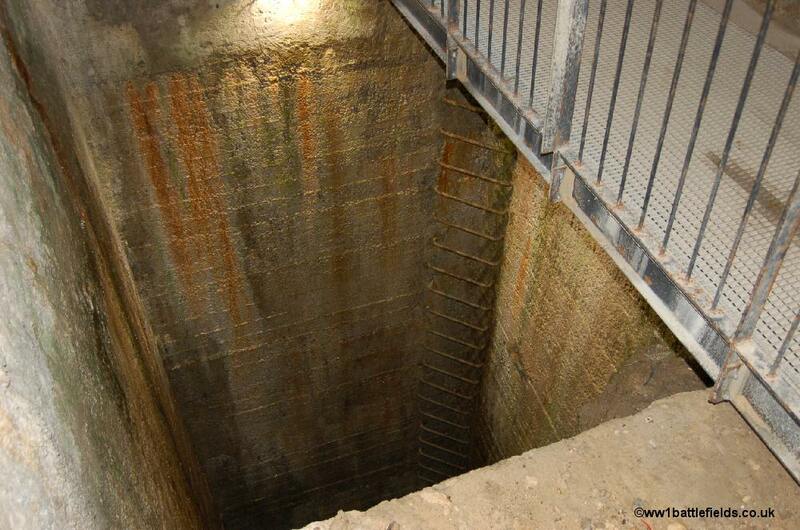 However, there was also another level below this one, and there is a large shaft which leads down to it. 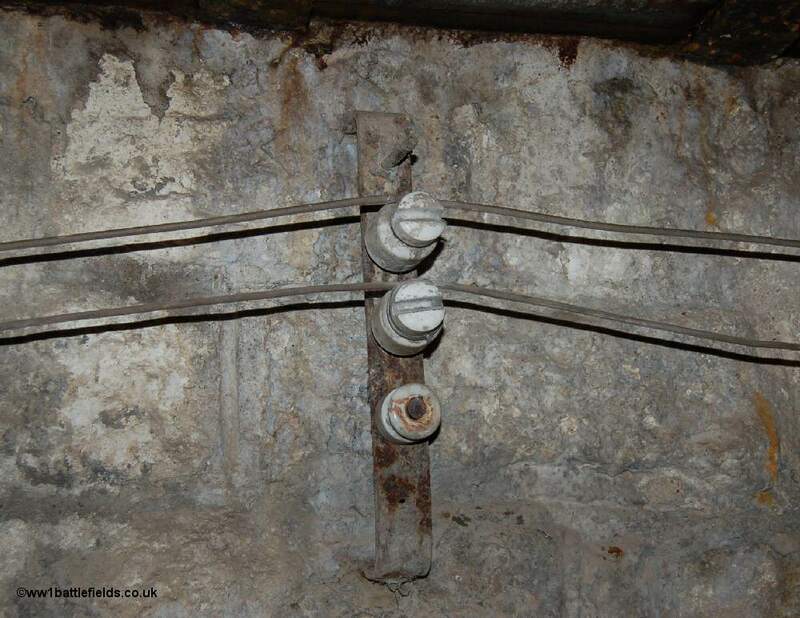 This also is lined with iron rungs in two corners, but the prospect of climbing these much more exposed rungs (and this is a deep shaft) must have been quite daunting for any solduers without a good head for heights. 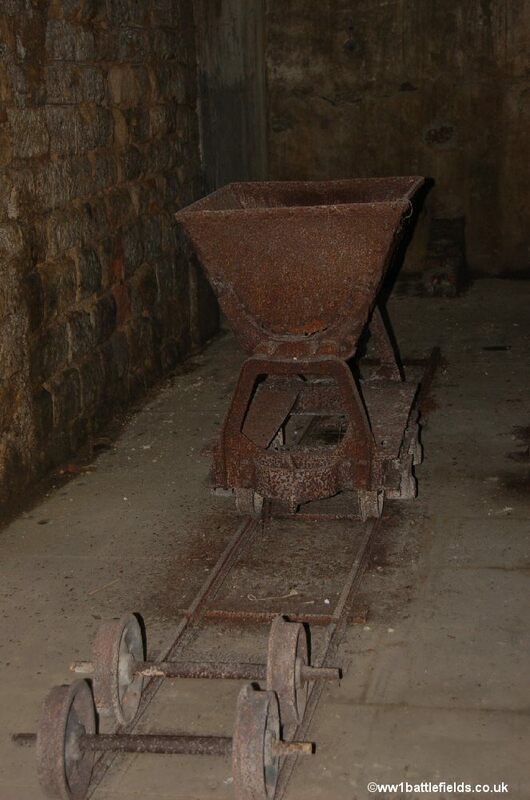 Nearby are relics showing how materials (perhaps munitions) were moved around: a carriage on rails can be seen. There was also a boulongerie (or bakery) to prepare bread for the garrison. The oven itself can still be seen. 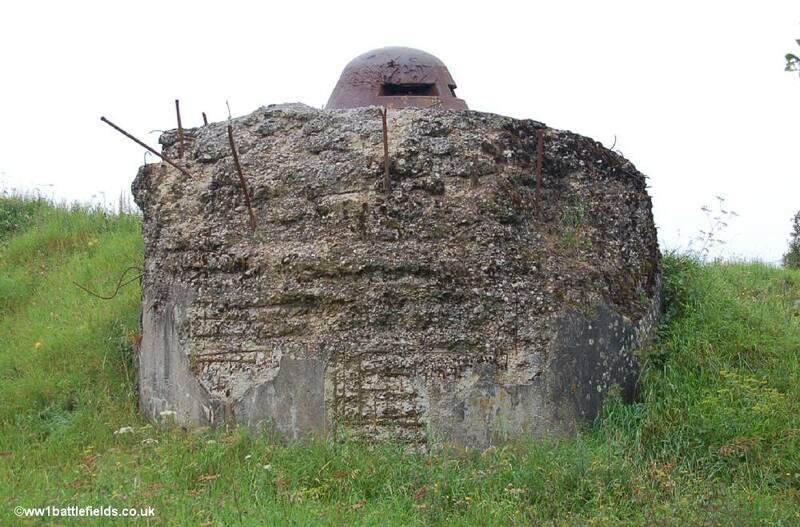 More latrines can be seen, and then you reach one of the main sites within the fort - the 155mm machine gun turret. This was built between 1907 and 1909. Wheels turned by hand were used to change the aim of the gun, and the turret was retractable, being raised to fire and then lowered again afterwards. 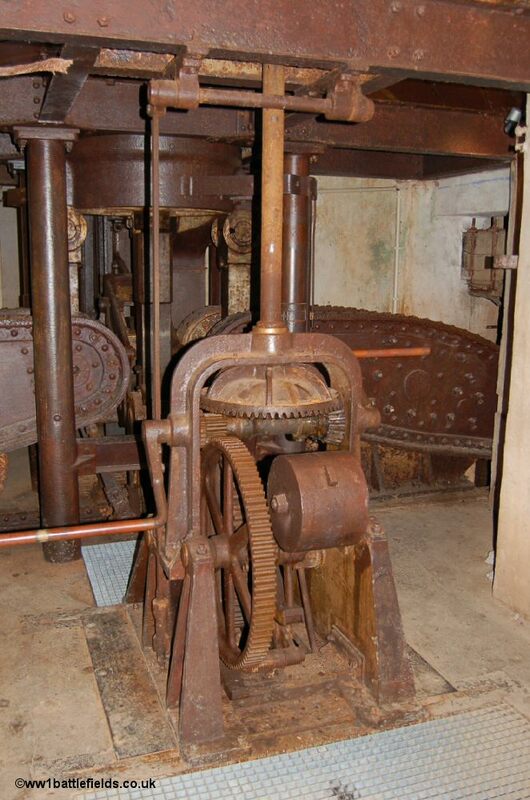 Again this was performed by hand, requiring three men to turn the wheels which operated the winch to achieve raise it. 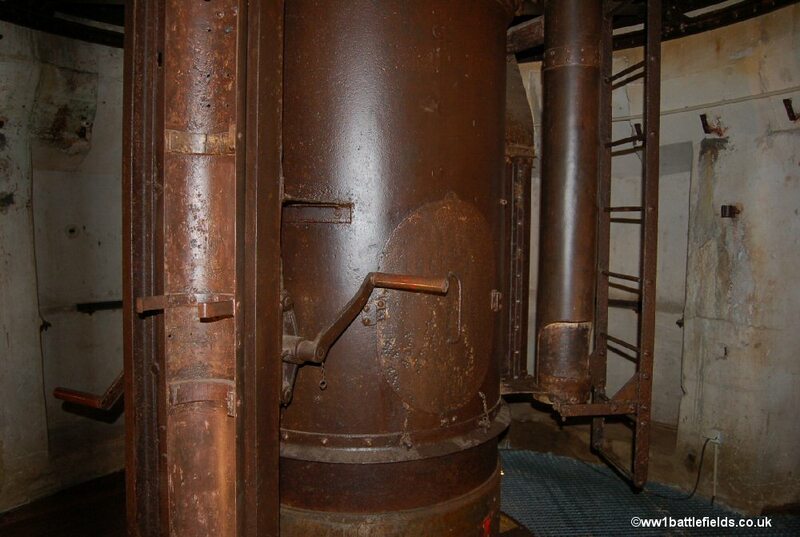 The mechanism relied on heavy counterweights, and so the lowering occurred by the gun's own weight. To raise it the 60 cm required for firing, however, took the three men two minutes. 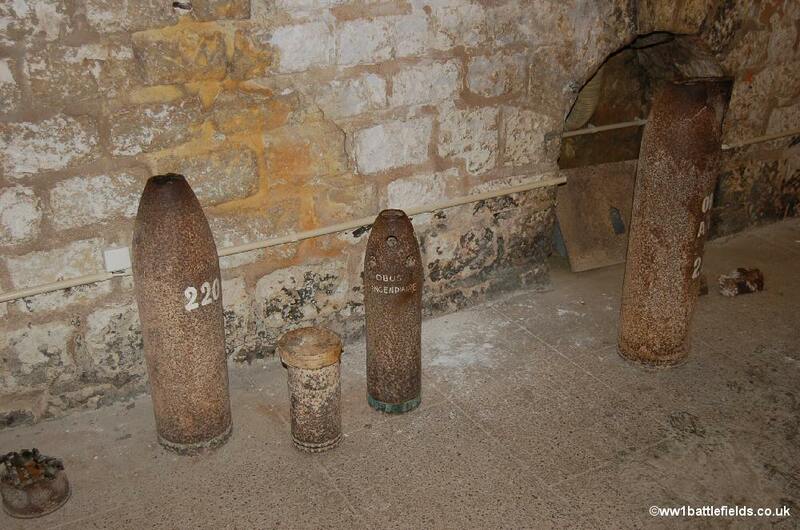 The shells used weighed 43 kgs each, and had a range of over 7 kilometres (about four miles). In theory, the gun could be fired very rapidly, but in practice the human constraints slowed it down - the noise was so deafening, and the backfire of carbon dioxide each time so great that the men operating it could not fire as rapidly as the machinery allowed. Walking back along the corridor towards the exit, one has no idea of the temperature or the weather outside - it is a little like leaving a cinema on a bright summers day and emerging blinking into the sunlight after a long time in the gloom. It is possible to walk up onto the top of the Fort, using paths that lead up from the sides of the main structure at the front. On the way around, one can see the fortifications and defensive positions that were built into Fort Douaumont. 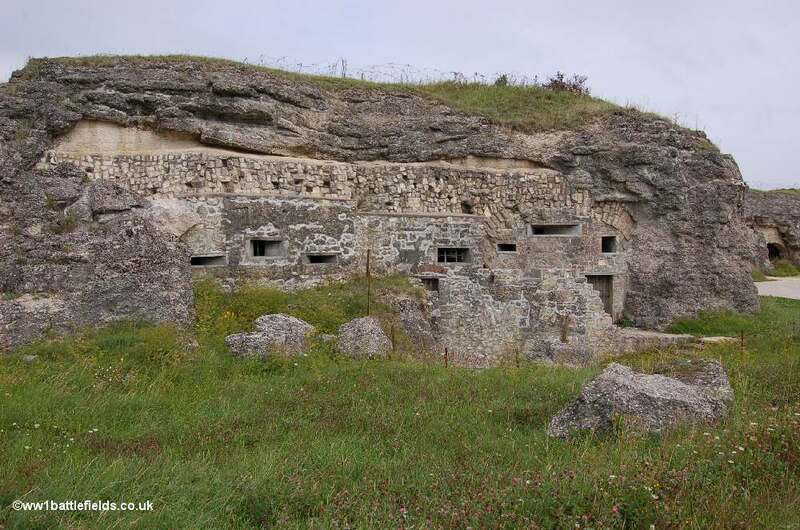 I have a number of old postcards of the Verdun area, and one shows the exterior of Fort Douaumont in the years after the war, when the damage caused was perhaps clearer than the neater appearance it presents today. On the top of the Fort, there are a number of machine gun turrets and observation positions visible. 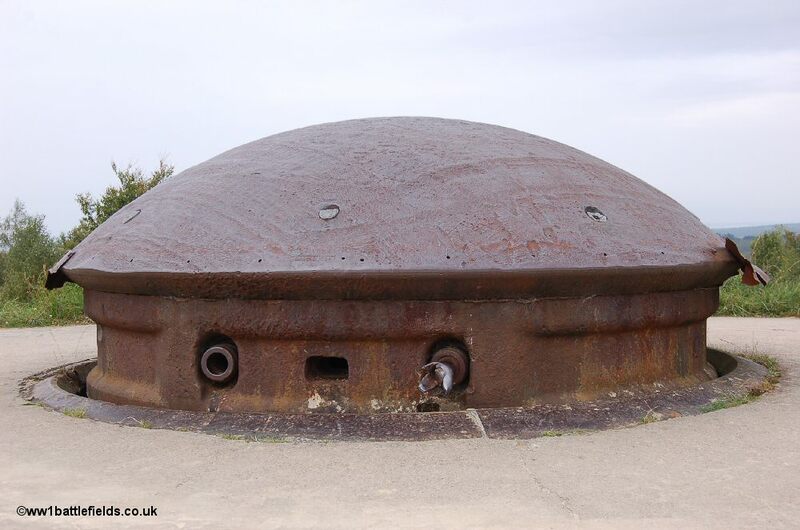 The largest concrete base is where the 155 mm machine-gun turret seen on the interior of the Fort is positioned. 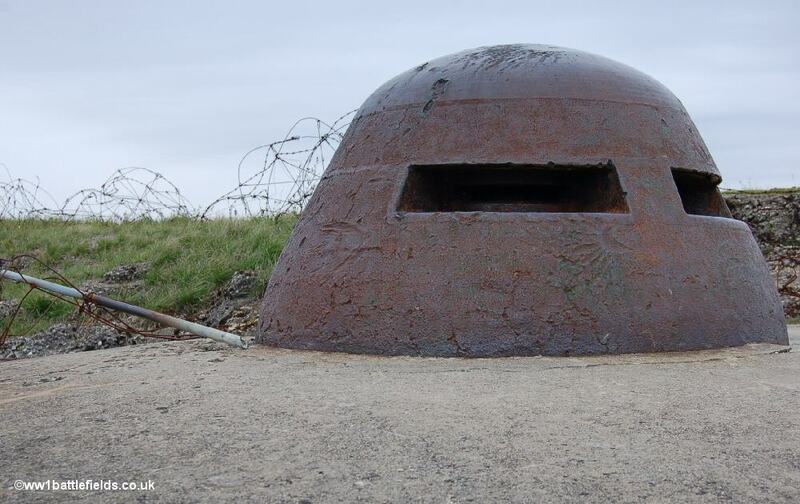 There are a number of observation posts set into the top of the fort; generally metal domes with observation slits which rise higher from their concrete bases than the machine gun turrets. It must have been a highly nerve racking experience on occasion to be in one of the metal domes if bullets and missiles were flying. 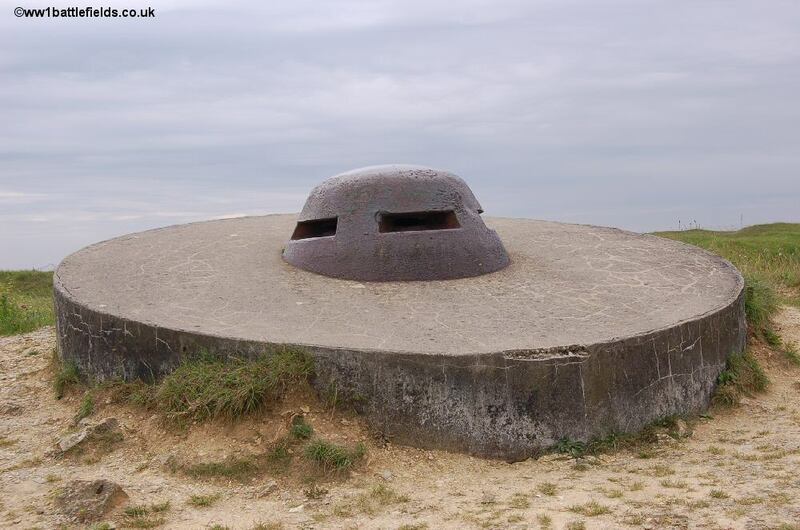 There is also a 75mm gun turret to be seen on the exterior of the Fort. The barrels of the guns can actually be seen protruding through the cupola.